There’s still leftover turkey in the fridge and a bewildering variety of sweet breads on the table and they haven’t finished cleaning up the bodies from Wal-Mart and Mumbai but the holiday seems to be over already, at least in Illinois, where Governor Blagojevich (Serbo-Croatian for “I haven’t got a clue, really”) is closing a stack of historic sites and laying off two dozen IHPA staff. I commented previously on the economic ingenuousness of this move (see my blog of August 3). People look at historic sites and they think “luxury” compared to social services. But historic sites are key to tourism, which is the state’s primary industry. Social services are necessary, but they don’t provide an economic payback the way preservation does. In all likelihood the Clueless One was primarily after the 24 IHPA jobs, since jobs are the biggest piece of any budget in this country. Does this make sense? Why not go the next step and sell the Dana-Thomas House, the Lincoln log cabin, and Fort de Chartres? If this was really about budget and not political football, that would be the logical step. 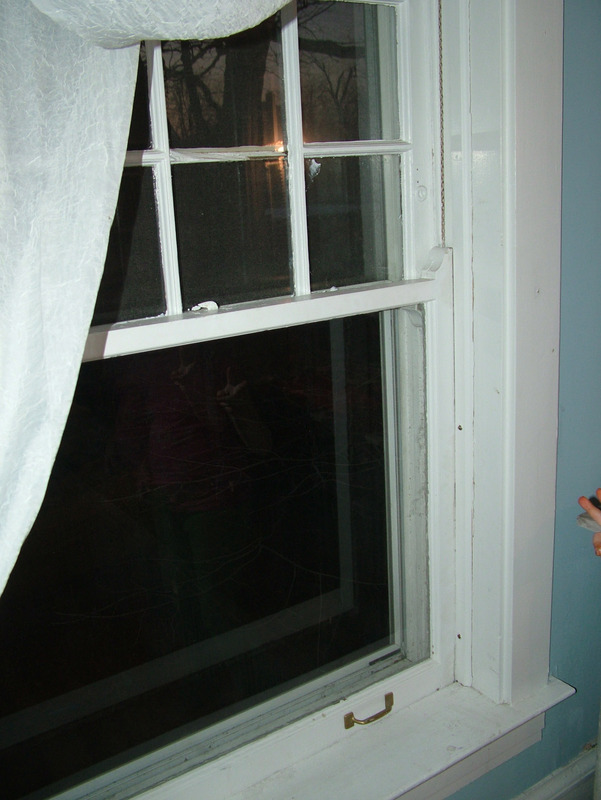 110-year old windows. One breaks on Tuesday night, so on Wednesday morning I fix it. Cost: a little over an hour of my time, $15.99 for the glass and $3.50 for putty (already had the glazing points). 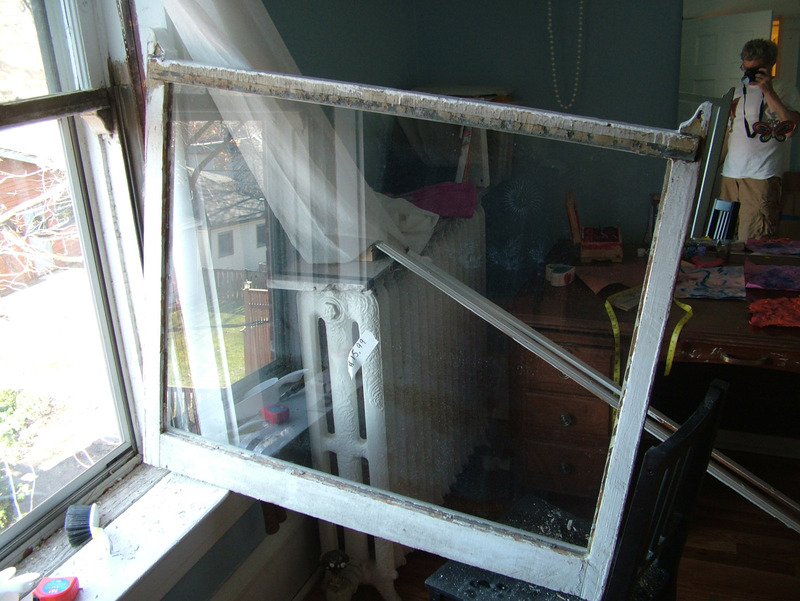 I am SO THANKFUL that I don’t have replacement windows. Because they can’t be fixed. 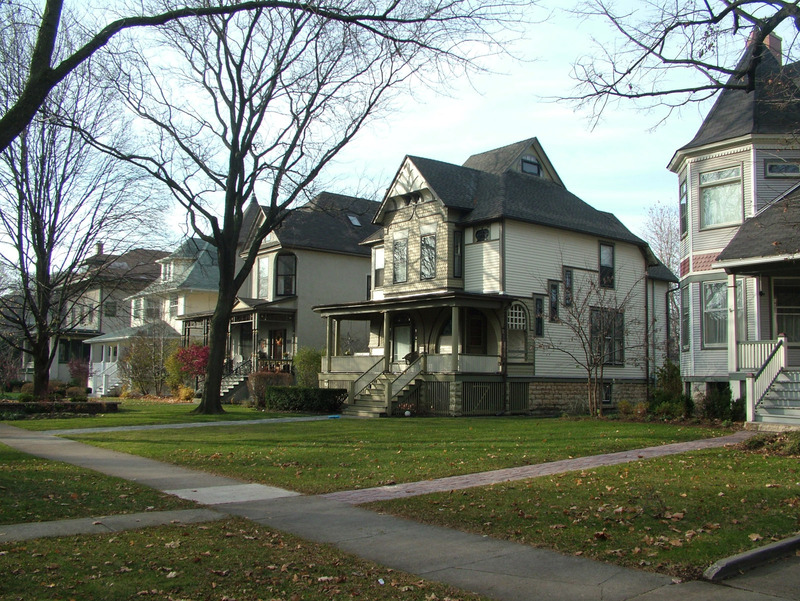 I am thankful I live in a town that has a viable, court-tested preservation ordinance which saves us from the teardowns and social pathologies that plague me-first suburbs like Kenilworth. I am grateful walking down my beautiful street to know that it will be a beautiful street next year. It is really that simple. I am thankful that I work in Chicago, which has a vital and diverse downtown and recognizes that its vitality could not exist without its historic architecture. I am thankful that we have a new President motivated by reality and not ideology, who is building a team based on ability rather than loyalty. I am thankful for the new students this year – both the historic preservation graduate students and my first-year undergads – both are VERY engaged groups, which makes the whole teaching-learning thing so much better in every regard. I might even dare say I am thankful for technological advances, at least the 4% of them that improve our lives. Of course family and friends, but that has never been the topic of this blog. And of course, the SAIC who tenured me (the last vestige of the medieval guild system) and John Bryan who endowed my chair, and all of the great organizations like Landmarks Illinois and the National Trust (links at right) who put me on their boards. And most of all, this thing called historic preservation and heritage conservation which has brought me to see so many wonderful things in so many places. These are my most prized possessions of all, and they are not possessions at all and they can’t be stolen or monetized or liquidated because they happened already. 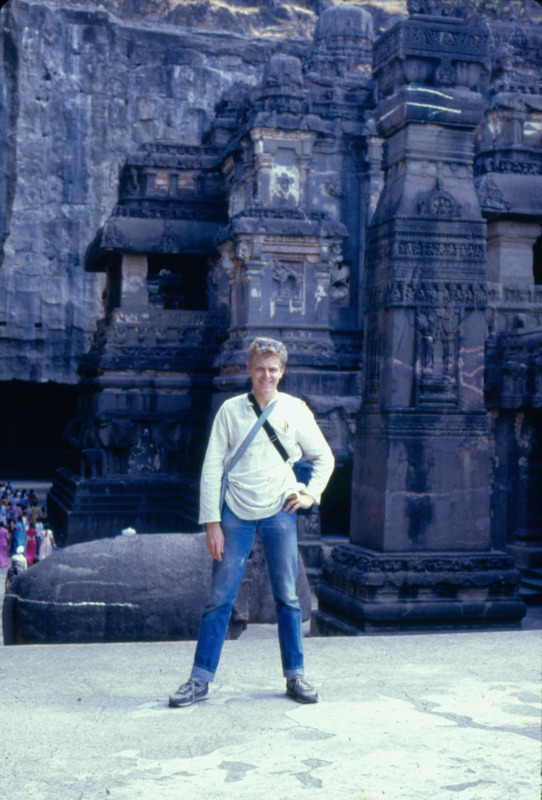 I gave a lecture at the Chicago Architecture Foundation today on Preservation in China, which was a compilation of observations from my last six trips there, notably the two SAIC student trips in 2004 and 2006. I broke it down into three basic challenges: 1. The challenge of fast-paced capitalist development combined with centralized planning control; 2. The challenge of intangible versus tangible heritage, i.e., a cultural bias against inhering cultural meaning primarily in tangible objects; and 3. 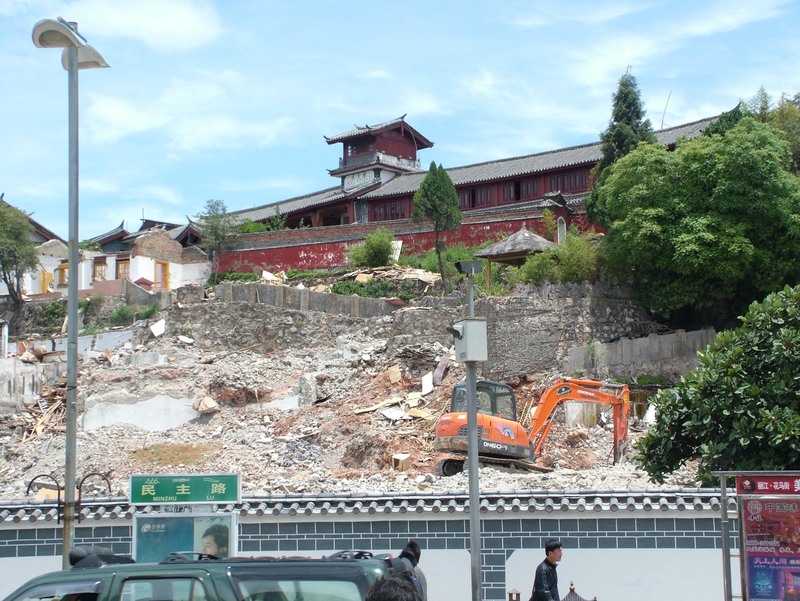 The devastating effects of catastrophic tourist development, as evidenced in sites like Lijiang. Here they tear down buildings in order to build brand new “antique” buildings. In Dali (also in Yunnan province) the most extensive example of this occurred two years ago and our students saw it new: a couple dozen brand new massive buildings bursting with 12-foot high golden statues recreating a palace temple complex that existed under the first Nanzhao emperor more than 1200 years ago. What drives these projects is catastrophic tourist development, which is what we have been struggling against – with some success – in Weishan, through the Center for US-China Arts Exchange of Columbia University. 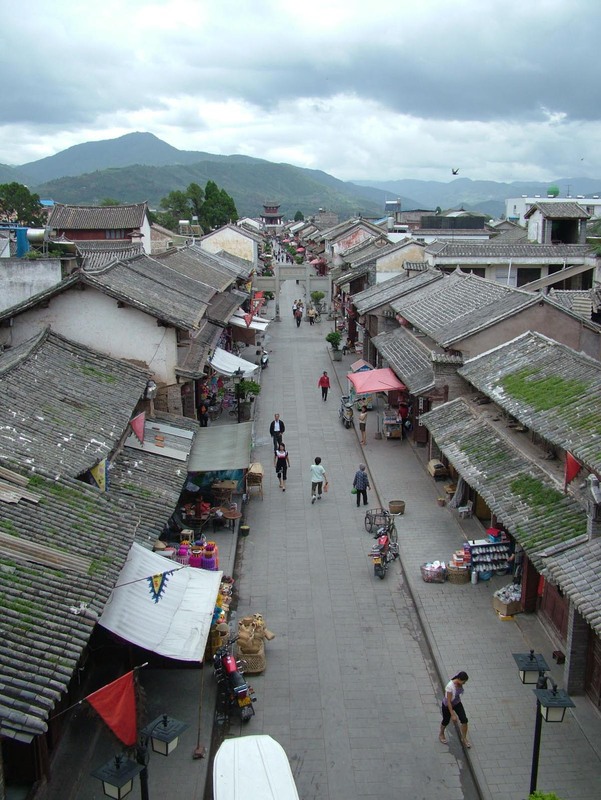 The basic premise of the student projects and our other efforts there has been to build a sustainable development model that doesn’t kick out local merchants and residents in favor of a tourist-only environment, as happened in Lijiang and, to a lesser extent, Dali. I would like to focus on one of the three challenges, which is the cultural disconnect between our Western idea of authenticity and the concept in China that a brand new “antique” can serve just as well, and indeed, may be necessary to help tourists understand a place. 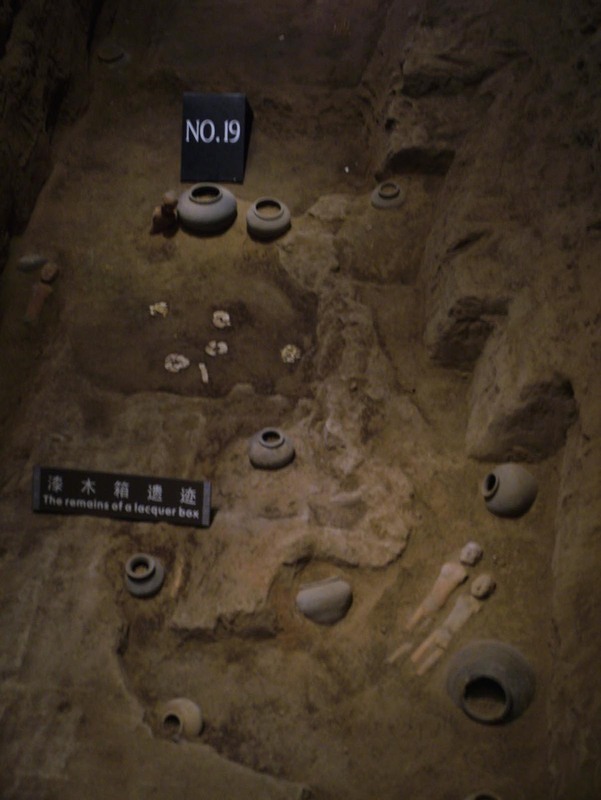 They rebuilt the gate house for the first Han emperor’s tomb in Xi’an, so the tourists would have a sense of it, even as they see the actual excavations of the emperor’s doll-sized retinue (more reasonably scaled than the Qin Emperor’s more famous terra cotta army). The idea of “fake antiques” makes some sense from an interpretive point of view, and if they are clearly marked so that you don’t get the wrong idea, then….oh, who are we kidding. Someone always gets the wrong idea. I remember seeing this in Ireland, where tourist-constructed mini-dolmens – actually archaeological vandalism – were misconstrued by other tourists as actual ancient monuments. 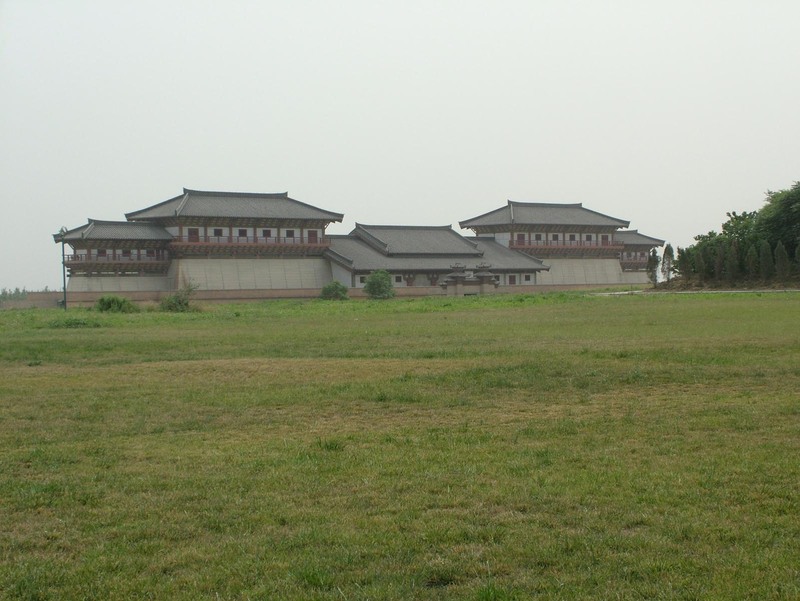 In Weishan, they want to rebuild at least a portion of the old city wall, and they probably will, although the location will not be correct and the appearance fairly conjectural. And in time, people will see it as original. Arguably the same thing happened in European cathedrals throughout the late middle ages as locals desperate for tourist cash devised ways to beg, borrow, steal or fabricate religious relics to attract pilgrims. 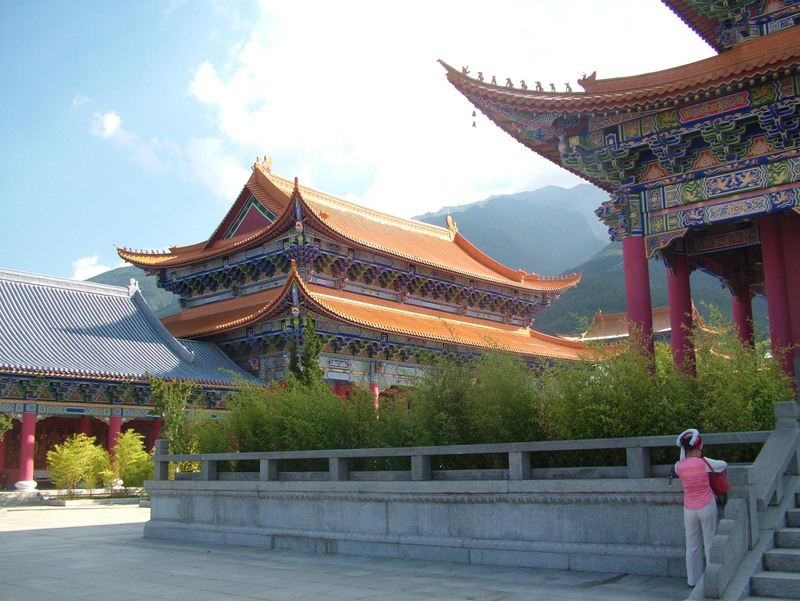 Dali has the stunning and authentic Three Pagodas – arguably among the dozen most important pagodas in China – and behind them is the ersatz Nanzhao temple, which is actually a real temple in that it has been consecrated by a bevy of Buddhist monks. 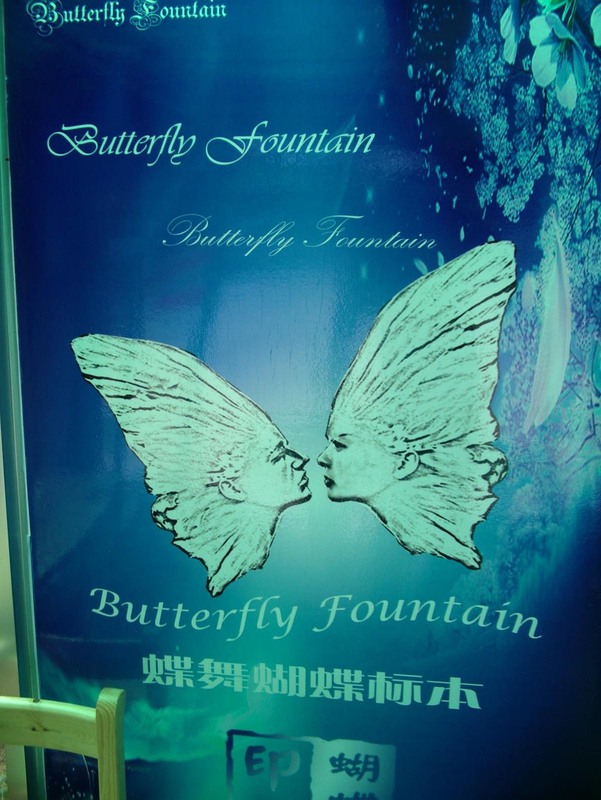 Nearby there is another tourist site, the Butterfly Spring, which was crafted perhaps two decades ago out of a reasonably attractive park and basically follows an old romantic legend about two lovers who become butterflies. So it is not real, at least on our terms. We could argue that it is a cultural bias, but I think that gives too much credit both to Self and Other. This is not unique to China, nor even to Asia, where the Japanese have built fully functional Belgian villages as tourist attractions and the Singaporeans have theme parks to rival Dollywood. The penchant for fake antiques which animated so many tourist development agencies in medieval Europe is alive and well in Eastern Europe, as I made clear in my Ukrainian blogs in November 2006. 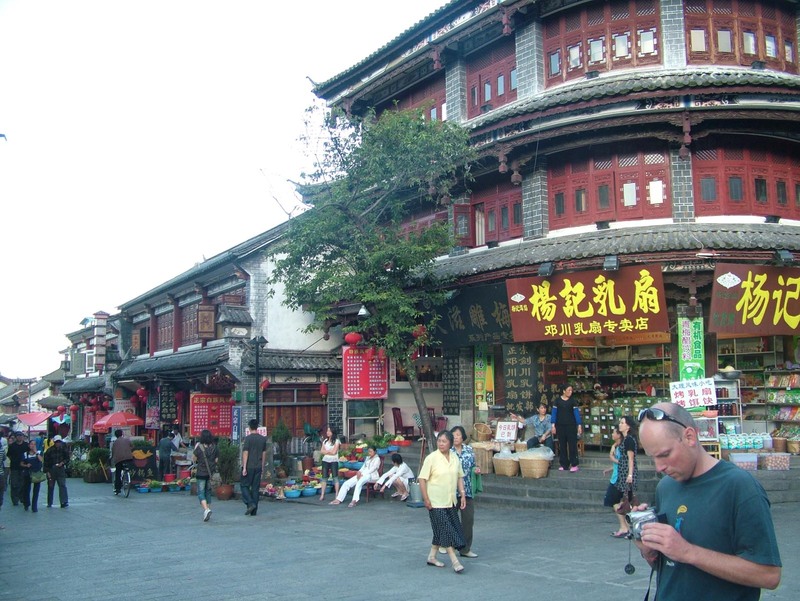 In China the commanding logic is tourism, and that tourism is not driven by international tourists: the vast majority of the market is Chinese (including overseas Chinese) tourists, and they are happy with the Nanzhao temples and the butterfly springs and they would likely help you rebuild the wall in Weishan. But as Christina Heyniger pointed out during our Sustainability conference this summer in Dali, the tourist market is a dynamic thing. Yes, a certain segment wants Branson and Dollywood and the Butterfly Spring and brand-new thousand-armed Avalokiteshvara temple. But the domestic Chinese tourist market, like all markets, will mature. In a few years they will be demanding authenticity just like the international tourists do. And places like Lijiang that bet the farm on tourism to the point of empyting the town of any other economic function, may well suffer. 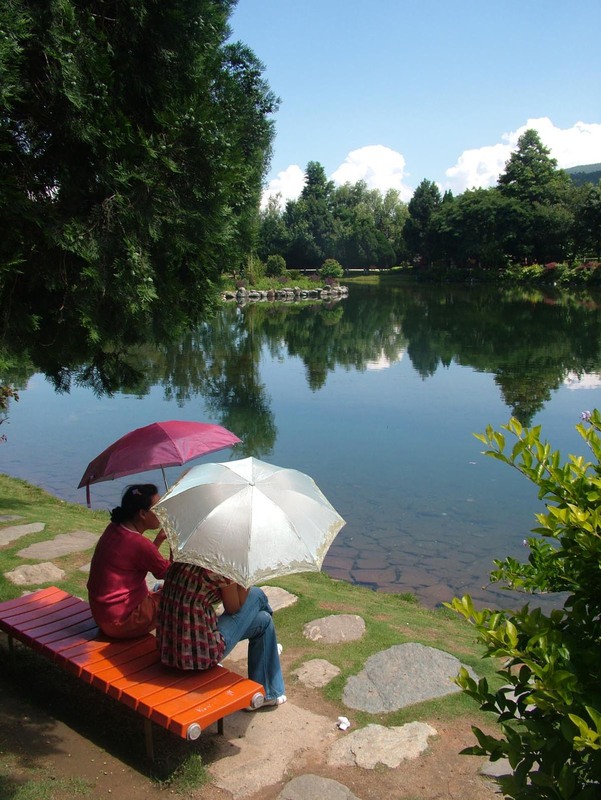 It already happened in Yunnan in Shangri-La. 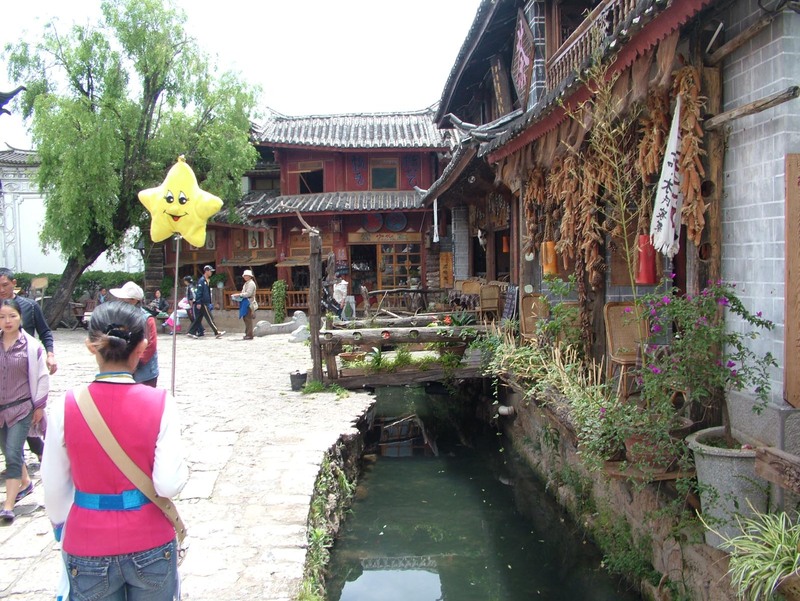 I am amazed at how many times I have talked about the catastrophic tourist development in Lijiang – notably at the ICOMOS conference on Sustainable Development in April 2007 – and no one has ever challenged me or said that Lijiang isn’t somewhat ruined by tourism. I was there this summer and it is a nice place. But it has lost its sense of authenticity – all you see are other tourists. 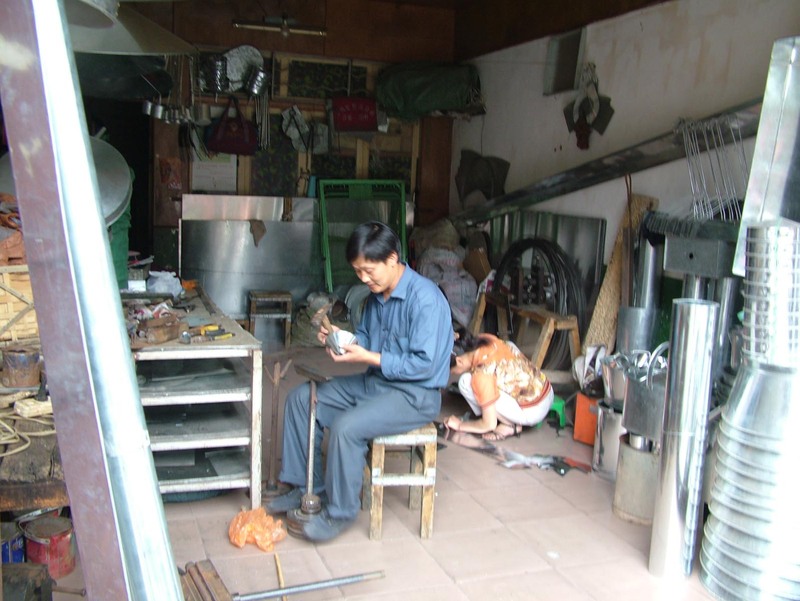 Weishan has funerals and weddings and farmers and merchants and people buying string and hardware and teapots and water heaters. You don’t see that in Lijiang. 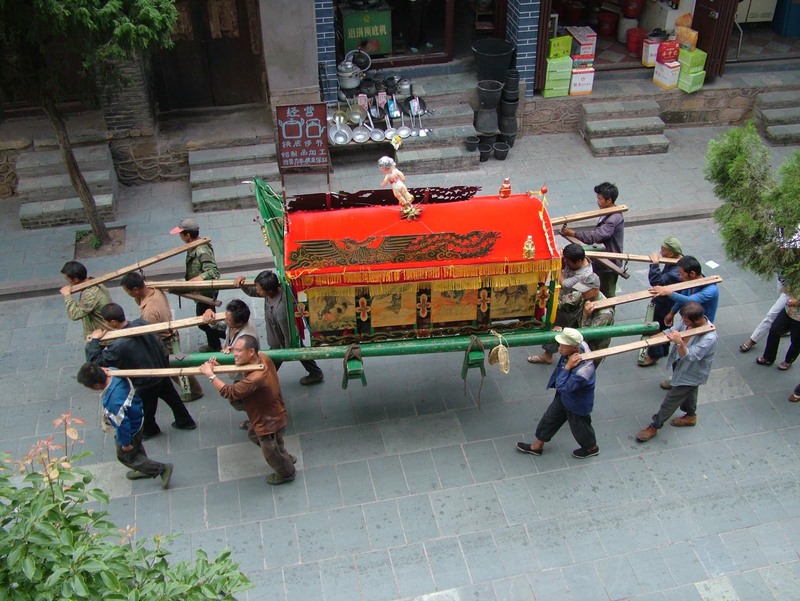 But seeing the funerals and the coffin makers and calligraphers and just the old guys playing checkers makes you realize the limitations of our own preconceptions too – there is a vital role for intangible culture. It isn’t just the buildings, it is the real life, and when I say real life I am not talking about romantic ideas of the Native Other or any colonial, post-colonial or even globalist expectations. Authentic reality is a malleable thing – never the Self or the Other, never a category but always a messy, contradictory thing. 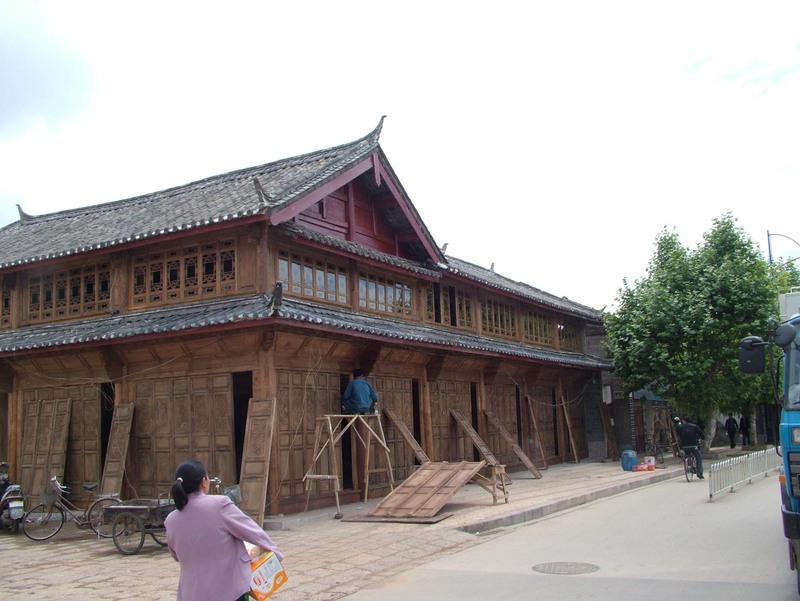 Having historic buildings and intangible heritage only makes it messier – and thus more real. And that, in a sense, is what is wrong with the “fake antiques” and what Ada Louise Huxtable disliked about Williamsburg and our own fake antiques – it becomes a simple narrative, which is the opposite of history. Authenticity is about retaining the contradictions and complexities of life as it was and as it is, and seeing those complexities and contradictions over and across time and place. 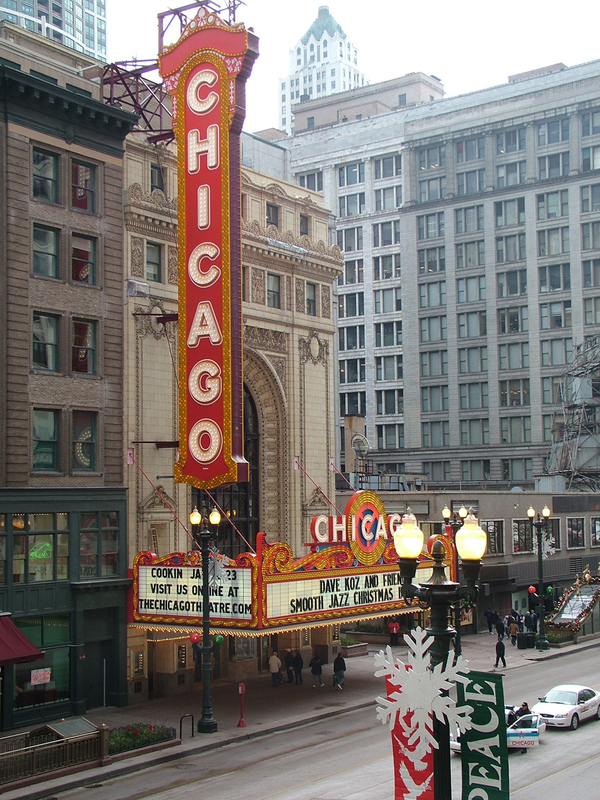 President-elect Barack Obama was known as a champion of historic preservation in Chicago and Illinois. Michelle Obama served on the Commission on Chicago Landmarks for several years. As Obama enters office amidst a massive economic crisis, I can only hope that preservation becomes the new calculus of a sustainable economy: creating jobs without wasting resources. But back to preservation, which interestingly enough, offers a jobs-rich way to remake the economy. Rehabilitation of existing buildings is inherently sustainable – it makes the most of materials that are already there and takes advantage of carbon footprints made long ago. Rehabilitation is sometimes expensive, because it is more labor-intensive and that labor needs to be more skilled than those guys throwing together gypsum and pressboard on the prairie. But that labor intensity is an advantage in the coming year as unemployment continues to grow. And it is EVERYWHERE – rehabilitation of historic buildings can happen in every community – they are local jobs. Plus, the money spent on local rehabilitation tends to stay local. It doesn’t go to China and Arkansas with Wal-Mart. Study after study has shown the intuitively obvious – preserving America’s built resources generates more positive community economic spinoff than highway construction or new housing development. Think about it historically – preservation was rife in the Great Depression in places like Charleston and Greenwich Village. This was the time of sweat equity, and that community-oriented effort continued into the 1960s and gave us the modern preservation movement: a movement about communities taking control of their environment. 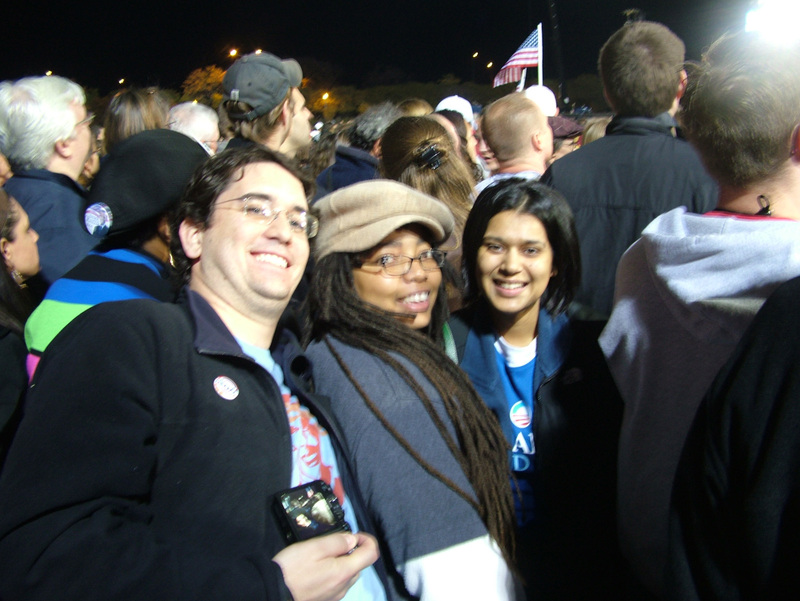 President-elect Obama was a community organizer, which may explain why he has been a preservation advocate – because preservation and grass-roots community development have always been hand-in-glove. They have always been a way to rebuild the local economy. Why not the national? In an election that seemed to prove that people were thinking, that citizens could be motivated by positive emotions rather than the fear that ruled the roost for the Millennium So Far, there were some sour notes. One of the sourest was in Kenilworth, where someone spent a million dollars stoking fear of the National Register of Historic Places and got voters to reject the idea of a National Register district by a good margin in a non-binding referendum. This is a victory for ignorance, and not an innocent excusable ignorance but a willful ignorance. They ignored the fact that when you are on the National Register of Historic Places you have the right to tear down your house any day of the week. They ignored the precedent of neighboring Winnetka, which has a couple districts and even foreswore – by law – the idea of local binding designation. You can still tear down your house any day of the week in Winnetka. But at least those people can get the tax freeze if they want it. Especially galling was the fact that the willfully ignorant used ME in their well-funded campaigns of misinformation, an egregious example of country manners and arrested development; grade school bullying unchecked. You can find the quote and the context in earlier editions of this blog that dealt with the peculiar delusions of a cohort of Kenilworthians more kennel than worthy. I noted “in fairness’ (a phrase untranslatable to this cohort) that National Register designation has been used by some suburbs as a prelude to local landmark designation, but that there was NOTHING about National Register designation that led to local designation. Just because you don’t want to go to college doesn’t mean you shouldn’t finish high school. Yes, a lot of people use high school as a stepping stone to college but that is a separate, distinct action that is not presumed by the former action. They eliminated this context, twisting my point INTO ITS OPPOSITE: National Register designation leads to local landmark designation. In my original blog, I compared this “whack logic” to NRA types who feel laws prohibiting machine guns for 6th graders provide a “slippery slope” to elimination of all guns. It is a bald and bold LIE, but it can get people scared, and as previous elections and grade school bullying prove, negative motivations work well. 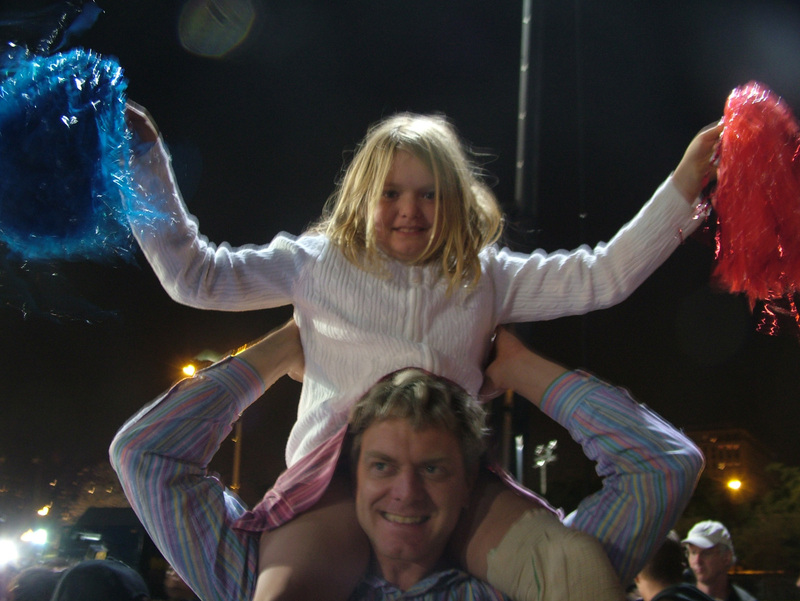 Having stood for hours with my family in the calm, collected joy of Hutchinson Field with tens of thousands proud to be for something rather than against something, I think that attitude is a damn shame and a waste of money. 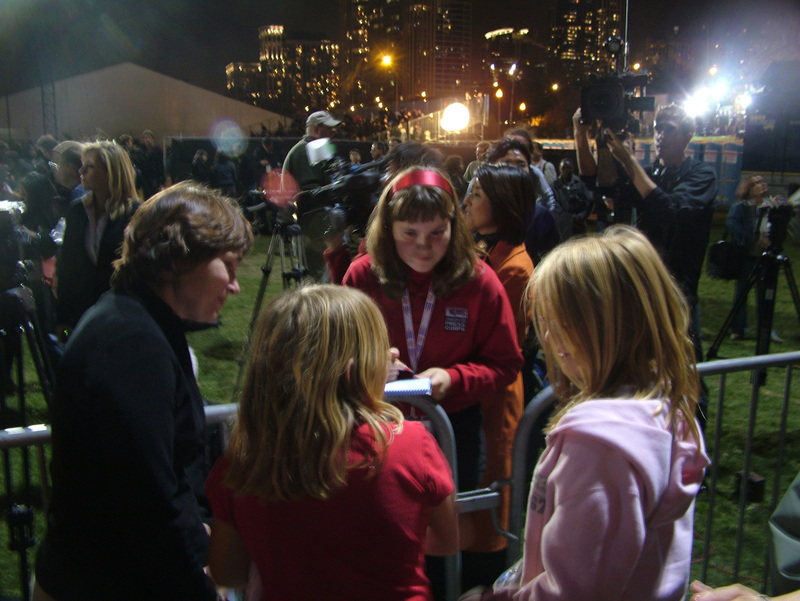 As I have gotten older, I have been less concerned about being part of historic moments, but thanks to alums Mira Patel and Ben Roberts, both daughters Felicity and Alexandra were able to come to Grant Park with Mom and Dad last night and be part of an amazing moment in American history. 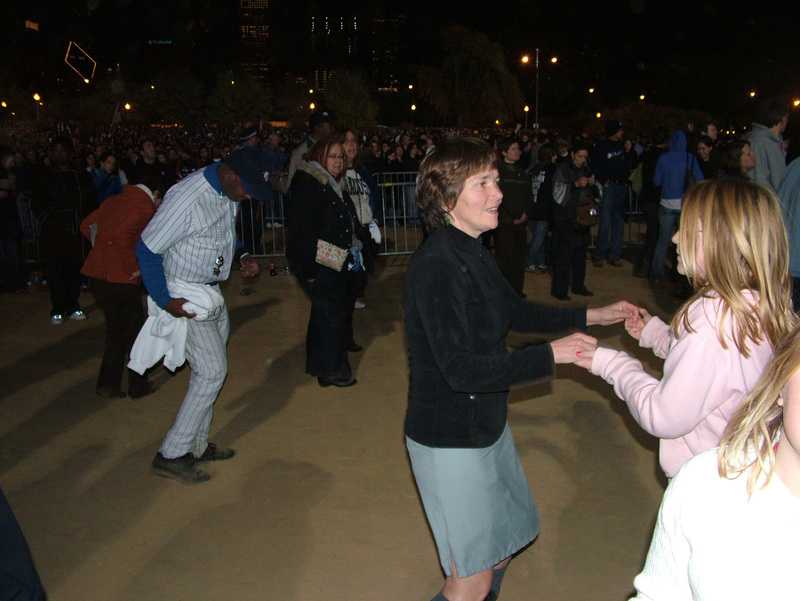 Felicity and Felicity dance in Grant Park while the whole world was watching. 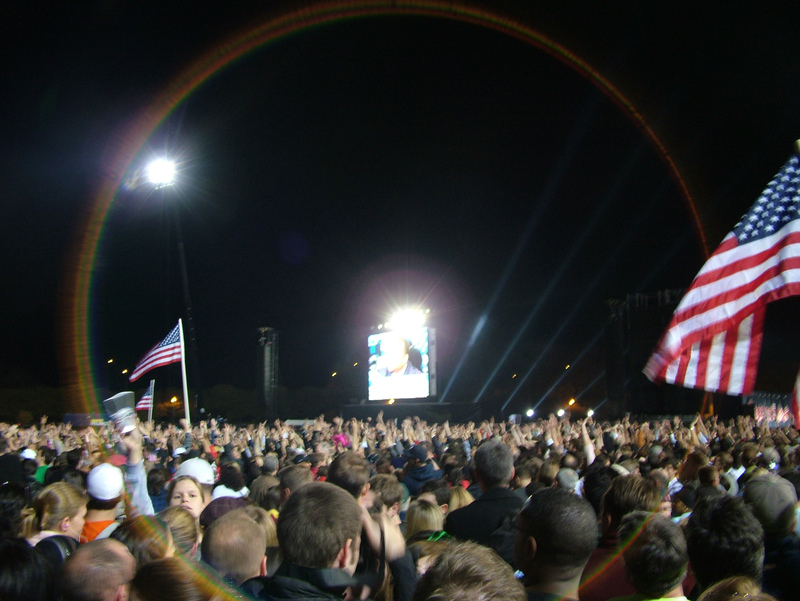 There was no fear, no panic, no chaos but hope incarnate and an American dream not deferred but realized. When I was young I read comic books, and there was a Catholic comic, Treasure Chest, that ran a serial about the election of the first African-American president. I can still remember that comic book and last night I watched it come true. Studs Terkel died the other day and so we bid farewell to the last living link to Chicago’s hard-boiled, street-level, gut-check, grimy sweaty literary tradition, because even though Studs was a writer, he was mostly a listener and long after Upton Sinclair and Theodore Dreiser and Robert Herrick and Sherwood Anderson and Ben Hecht started pushing literature in the direction of street talk, Studs was our living link to them, as he was to the streetcorner writers he actually knew, people like Nelson Algren and Richard Wright and Gwendolyn Brooks and he was the last of that Depression generation and he was an original and a radical. I first saw him at a late 70’s antiwar demonstration in Hyde Park and he was always at those. I met him at the Historical Society a decade ago and he immediately remembered Barry Byrne (whose unpublished biography I have written) and quoted his interview as if it were yesterday even though over thirty years had passed and I saw him three years ago when he was our keynote for the Preserve and Play Conference here and he talked about “checking out” soon but he was here too long and did too much good so there is no goodbye after all, just ninety years of keeping his ear to the streets and his hand on the megaphone and he made as much history as he recorded but both are prodigious, deep decades of accomplishment and he is a permanent part of Chicago’s character, which means he had an impact because that is how history is read in the present – in the persistent character of place and the character that persistent characters like Studs Terkel put in that place, which was always Stud’s Place despite the red-baiting haters. How Studs would have liked to see this day, November 4, and how much he did to make sure it could happen. You are currently browsing the Time Tells blog archives for November, 2008.